April 21, 2010 - On Tuesday the Federal Aviation Administration (FAA) indicated the agency had proposed a $330,000 fine against North-Aire Aviation, a flight school for falsifying records and failing to comply with its FAA pilot school regulations. Today North-Aire Aviation released a press release to give their point of view. “In January of this year, North-Aire Aviation, LLC, of Prescott, Arizona, received a letter from the FAA stating the flight school had been investigated by the FAA in April of 2008 while the school was under different management. "At that time, the FAA purportedly found discrepancies with the flight school’s training course outlines for Part 141 training. “The training course outlines for Part 141 training had been reviewed and approved by the FAA four months earlier. North-Aire’s management during that period worked with the FAA, and the few students whose training was in question were retrained to the FAA's satisfaction. It is the understanding of North-Aire’s current management that the matter was remedied and resolved favorably with each of the students receiving their appropriate certificates. 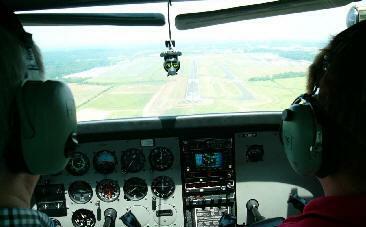 “North-Aire Aviation has trained thousands of pilots from 46 countries over its 36 year history. Incredibly, the flight school has not had one accident since its inception in 1973. By providing quality training and support, students are able to graduate with confidence and the ability to competently and safely operate aircraft wherever they live. “Current management of North-Aire Aviation was not aware that the FAA was poised to take this punitive action, nor does North-Aire agree with the discrepancies that the FAA suggests occurred. It is unclear why the FAA would just now release information on an alleged infraction that is almost two years old, giving the impression that this is a new investigation of an alleged ongoing infraction. North-Aire Aviation intends to fully exercise its rights in discussing the matter with the FAA in the hope that the matter may be favorably resolved before any further unnecessary and inflammatory information is disseminated. “When current management acquired North-Aire in August 2009, it immediately began building upon an established reputation in the community and with the FAA for cost-effective and superior student flight and ground training. North-Aire’s aviation staff has qualifications of the highest caliber, ensuring that all training is appropriate and meets every FAA requirement. “Working closely with the FAA, and under FAA oversight, students are assured compliance with the FAA's regulations as well as quality customer service. In fact, the FAA has not expressed any concerns with current operations, and North-Aire is training and graduating students with their appropriate certifications on a daily basis with no interruptions”.